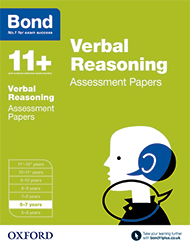 Find out more about the 11+ verbal reasoning exam and how Bond 11+ verbal reasoning resources can support your child on their path to exam success. Verbal reasoning tests assess children’s problem solving skills when working at speed, and also test how effectively they can process information. Verbal reasoning is not part of the National Curriculum in state primary schools, and this style of assessment may feel quite strange for children who have not seen questions framed in this way before. This is why practising these kinds of questions at home is so important: it helps familiarise children with a style of testing that they won’t experience at school. 11+ verbal reasoning exam papers are timed and usually last between 45-60 minutes. Children should practise with timed 11+ mock test papers, as well as working through non-timed practice, so they can see what they are able to do within a given time frame. Verbal reasoning is not taught as part of the National Curriculum in state schools so it’s important to practise these kinds of questions at home. This will build your child’s confidence and help familiarise them with a style of testing that they won’t experience at school. Here are some ideas for you to try at home in order to help your child prepare for their verbal reasoning 11+ exam. Year 4 – check up on basic skills during the summer term and use the summer holidays to develop logical thinking and problem solving skills. Playing word games to further develop their knowledge of vocabulary and synonyms, as well as their logical thinking skills. Suggest a word to your child and ask them to find a word that is opposite then similar to it, or a game where you suggest a pair of words and your child tried to find the common link.